Last edited by mlindborg; 07-27-2018, 07:55 PM. Will the price of the final version be higher or same ? Probably it will be a bit higher. What about body manipulations? Tall,short,fat,thin and so on... Do you aim at making it as good as Adobe Fuse or iClone or something like that ? Mainly I would need it for making background characters .. I plan creating the main ones on my own but it takes time and so your software looks good enough to make background characters for my project for city populations and use AI to drive them.. I'm making morphs for weight and muscularity. Afaik there's no good way of manipulating the skeleton/physics asset in-game, so you can't really deviate from the original proportions of the character that much. It has a scale slider though which uniformly scales the character. I don't need in-game use for my project.. as long as in-editor it can deliver good results it is fine. I would need it to be able to generate as many combos as possible for creating a good looking believable population. What about textures resolution ? Will it be possible to set how many details ? Will you add the option to put even custom created base meshes for the body other than those made by you? I would need it to be able to generate as many combos as possible for creating a good looking believable population. What about textures resolution ? Will it be possible to set how many details ? Will you add the option to put even custom created base meshes for the body other than those made by you? In my experience, generating a lot of varied characters is more about clothing and hair and not that much about the face or body. As I said in OP you can add this yourself easily, just skin to character and add to data table. What about textures resolution ? Will it be possible to set how many details ? The textures are average resolution but there are a lot of them combined for different features so it adds up. As for performance, it's a high poly character, if you want to have a ton of them you would have to LOD pretty aggressively. After I'm done with the body morphs I'll get to LODs. Will you add the option to put even custom created base meshes for the body other than those made by you? You mean swapping out the body and keeping the head? Probably not but I guess we'll see, it wouldn't be much work to include a head-only version of the characters. I was thinking more about having the ability to like replace the ears on any of your base models with my own designs, same for the nose or arms, legs and so on.. to create more combos at will and even create alien type characters with custom body parts ? Seems kind of cumbersome to put together. Also you'd get hard edges at the intersections. I'll be focusing on normal human characters. We got a previous work on a Character Customizer with lots of issues, mostly discovered after purchase unfortunetely. There was also a sense of hype and I think people didn't ask too much, so please dont get bothered with these many questions you will find here, because most of them got derived from the disappointment from the other asset. That being said, I want to say that you asset really looks great. The presentation is clean, the videos detailed, all one want to see for something most users are in deep need. Making a hero character, your asset seems great, the features you want to add seems also great, but I would put a priority order on them for a couple reasons: some are great but not needed as others, while some are difficult and will cause too many changes that might break compatibility with previous versions, so it is complicated. I would prefer a simple and streamlined version with still lots of flexibility than getting something that will make further self improvement a bit harder. Thanks for sharing the details while in WIP, we do appreciate and you surely got a buyer here! Ah forgot to mention something very important: Give those girls some breasts >.< !! Those are too tiny. Creating a function for randomizing options wouldn't be difficult. Possessing them and changing the options wouldn't be a problem either. I think the challenge would be saving and loading. Currently the save function just creates a SaveGame of the name you type in the box and stores the properties of one character. Ultimately, different games have different requirements and I don't think I can make a generic save system which covers all cases. It has the same proportions and joints as the UE4 mannequin so there shouldn't be any problems there. How good it'll look depends on the animations. Clothes is no different from any other pipeline. 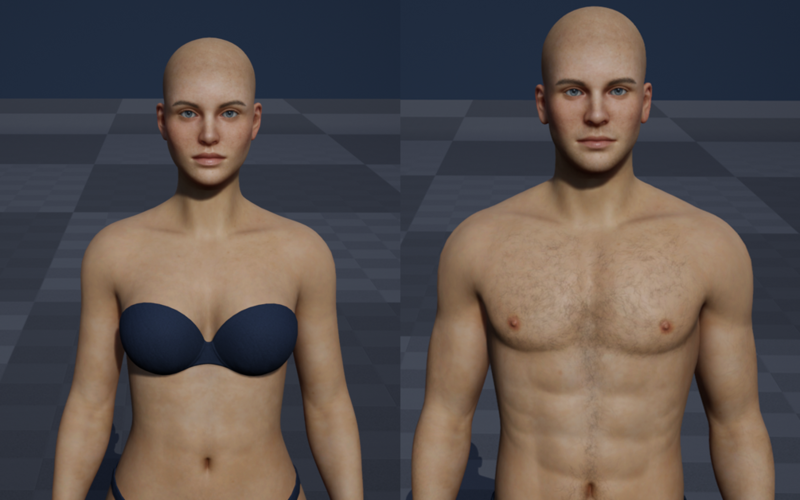 Just export the character, model the clothes on top and copy the skin weights over or skin them manually. Making hair for UE4 is pretty difficult. Everything from geometry to textures to physics to shadows. I'm still learning a lot on this, which is why I haven't made that many hairstyles because I don't think they would be high quality enough. Maybe I'll make a tutorial some time. The head is very high poly, adding more wouldn't do much. If you wanted to have higher quality facial animations you'd probably use wrinkle maps. For a game that might be good, but for a film where you want to have a close up to the face, a highly detailed one is important. My intention is not that you would provide it, but if the head can be replaced entirely and easily would be a plus. This was usued in Fortnite game during the movie shots, so it is important for me which are working in the movie area. Seem's really cool, my 2 cent is more hair and clothes (this provide something that doesn't exist on the marketplace for a character creator system... is hard to create hair or clothes), your customization seem's fine to me with the preset, if you can provide more starting clothes and hair (and also sell it in a different package) will be really awesome for me. Also is really important to create different looking character, but from the video seem's really possibile atm. This is surely the right approach, i'm really hyped. Really a nice work, really interested in buying this when i see some clothes. Last edited by kalakus; 03-11-2018, 07:08 PM.